When physician-scientist Rachna Shroff, MD, joined the University of Arizona Cancer Center last year as the new section chief of gastrointestinal medical oncology and leader of the GI Disease-Oriented Team, she set her sights on expanding clinical trials, which give patients access to experimental drugs with the hope of ushering in safer, more effective treatments. Just last month, Dr. Shroff opened a national Phase III study through the Southwest Oncology Group (SWOG) investigating nab-paclitaxel in biliary tract cancer — the first of its kind in North America. Biliary tract cancer, arises in the bile duct, a series of tubes that connect the liver to the small intestine. 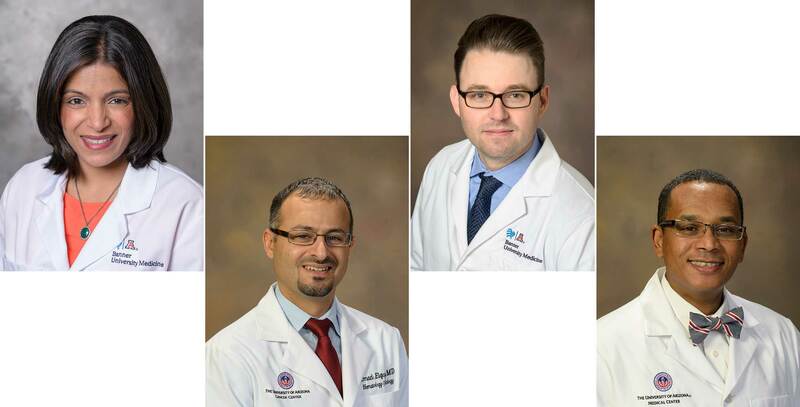 With Dr. Shroff at the helm, the rest of the team includes Emad Elquza, MD, Aaron Scott, MD, and Hani Babiker, MD, all of whom are successful oncologists and clinical trial investigators. Over the past year, the research team has grown to support the additional trials, adding coordinators, nurses and other staff members to its ranks. The GI team is offering several clinical trials investigating immunotherapy, a type of cancer treatment that is different from chemotherapy, which attacks all rapidly dividing cells rather than specializing in cancer cells. “Squamous cell carcinoma in the esophagus is sometimes forgotten about in terms of clinical trials, but it’s a really important population,” Dr. Shroff said. UA Cancer Center patients also can receive molecular profiles of their tumors, which in many cases allows doctors to match patients to “targeted” drugs. These types of drugs are able to single out cancer cells more effectively than chemotherapy, usually by attaching to proteins that are more common on a cancer cell’s surface. Clinical trials investigating targeted therapies are available for patients with claudin-positive upper GI cancers, HER-2 positive GI cancers, GI cancers with homologous repair deficiencies, biliary cancers and refractory colorectal cancers. The latter trial in colorectal cancer is being led by Dr. Scott, who designed the investigator-initiated trial and is heading up national efforts to run it at multiple sites across the country. Patients with refractory colorectal cancer have run through most available treatments, and Dr. Scott hopes cabozantinib, which already is approved for kidney cancer, will be able to “target” and destroy cancer cells. Additionally, all patient samples nationwide will be analyzed by UA scientists to establish whether and how well the drug benefits patients. Patients need not be enrolled in a clinical trial to receive top-of-the-line care. The UA Cancer Center uses a “multidisciplinary” approach, meaning teams meet regularly to discuss cases. The path a patient’s care takes is shaped by input from multiple sources, including medical oncologists, surgeons, radiation oncologists, radiologists, interventional radiologists and pathologists. Whether they are participating in a clinical trial or receiving standard treatments, UA cancer patients are in good hands. “We are personalizing care for patients, both from a multidisciplinary approach, as well as at the genomic level,” Dr. Shroff said.